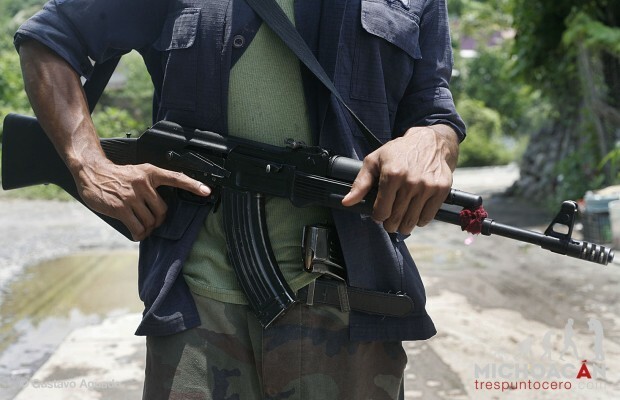 Shootouts between the autodefensas of the Michoacán coast and armed gunmen, suspected of being members of the Caballeros Templarios, have left a total of six dead and four wounded, including two in serious condition. It was announced to Michoacán 3.0 that four of the dead belonged to members of organized crime while the other two were members of the autodefensas, as well as the four wounded. The shootouts occurred on Monday after the ambush that the autodefensas received along the coastal road known as “200”, where the attack was aimed at the autodefensa leader, Semeí Verdía Zepeda. Members of the autodefensa movement have been carrying out various operations on the mountains to find the whereabouts of those responsible. This led to a series of confrontations that occurred in the mountain area in the community of Ostula, municipality of Aquila. “Members of the Mexican Army are on highway 200, but do not want to get in the fray, we need them to send in reinforcements and to support the community,” the autodefensas reported to Michoacán 3.0. Lay it out some more dude,whats your thinkkng?Thought the coastal ADs etc were basically not like a lot of the others?Whether or not they are CT they are being hunted for the assassination attempt I guess,, 'whoever ' they are? I dont get it who buys drugs in mexico and keeps these cartels in business? I know american and europeans have a high demand for drugs but do mexicans in mexico even have a high demand like the rest of the world?? Anyone care to answer? Serious answers only. When was this made pubic?? Since Monday...I was just a bit late to translate. The Ostula community has a Facebook page called "Solidaridad Con Ostula", they've reported on some other events too. Last paragraph is a classic, The Mexican Army are on HWY 200, but do not want to get in the fray. We need reinforcements!...Hahahaha what kind of Army do you have? The Salvation Army. They are the Army, President Calderons answer to the Cartel problem, is there no To protect and serve?? It is because when they step(Police/Military in to handle things everyone acuses them of murderer! Better to let AD handle it because at least they have public support. Soon the police in both countries will just have to stand by and watch as the criminals take over and run everything. Doing anything to stop them will be a crime! Los Marinas Armadas are responsible for patrulla de Mex 200. Los soldados de ejercito are responsible for actions inland of Mex 200. I have news for you. Soldados arrive during a balacera. There are people in civilian dress shooting at other people in civilian dress. Who is who? The soldados are not stupid. Not one of them wishes to be el primero carnada viva to establish who are the good guys and who are the bad guys. What would YOU do as a soldado? No soldado is stationed anywhere near his hogar de la familia. The tierra regional and la gente regional are complete strangers to him. Si yo fuera soldado, itll be my duty to shoot whoever is shooting, n question the people who aint. Its your duty...if you are to scared to shoot or not engage in a confrontation, por que chingados te metiste n las fuerzsa armadas? Too many retenes y puestos de controles stop working at night. Mota y cristal come down at night to las playas. There, they are met by lanchas that can easily hold 500 kg of product. The lanchas go north at night. During the day they hide out in lagunas y los bocas de rios y arroyos. When they get to near Sn Blas, the cargo gets put into traylors. The puerto de Lazaro Cardenas is used to hide cocaine, mota, cristal y heroin. Containers go on to ships. The ships go to Panama to puerto where cargo legitimo like platanos are loaded into the same containers as the drogas. La cadena tells the trabajadoes in the EUA which container gas the drogas. Dock workers in the EUA are usually under the control of union or gangs. They all now which number container has the cargo. This cannot be stopped.